The Body Solid GPR378 Pro Power Rack is a sturdy squat rack with a wide and tall frame to ensure movements are free enabling better lifting and better gains. 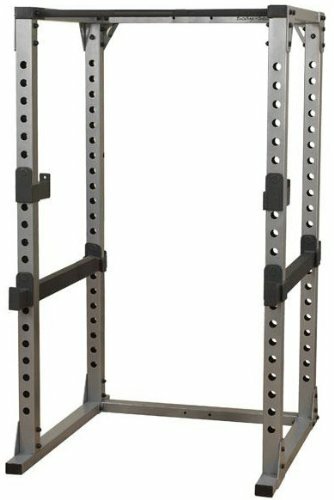 The power rack allows users to adjust the weight and position of the rack to accommodate their height. The Body Solid Power Rack allows for interchangeability and compatibility with different benches and workouts. That’s because the frame is made from tensile strength steel frames, rated as an 11 gauge. All four sides of the frame are heavy duty and welded for superior strength. The finish is also chip and scratch resistant because of a powder coat applied electrostatically. 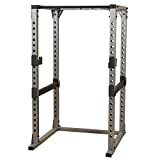 The power rack by itself sells for $725 on Amazon.com at regular price. However, as of 2014, the price has been reduced to $595. Body Solid also a more robust package that includes an adjustable bench and 300lb weight set for $1249 with free shipping. What makes the Body-Solid Pro ideal is that it’s a no frills type system. The unit is strong and can support up to 500 pounds, as suggested by the 500-pound set option provided by Body-Solid. While working in it, the frame feels very sturdy. The bar catches have been changed from round to square to improve the catch and reduce slipping and warping of the bars. It really doesn’t matter what type of workout a user wants from the squat rack. It has a wide area for workouts, providing optimal body range. It accommodates just about any kind of bench or attachment someone can throw at it, too. Whether someone wants to do push-ups, squats, curls, or even pull-ups, the Body Solid Pro can handle it. Even if someone is a beginning weight lifter, the GPR378 power rack supplies a workout and exercise booklet with recommended exercises for sculpting muscles. It also includes suggested routines and schedules to help builders increase or maintain their strength. One issue that some might have with the Body Solid Power Rack is the amount of time it takes to put it together. Since it’s a large contraption, it comes with an extensive list of instructions and parts. To ensure that the GPR378 Pro Power Rack is secure and sturdy, they have to be followed exactly. Another problem is the large size of the system. It’s basically a seven-foot tall, by four-foot-wide and four-foot-long box. Once it’s set up in a room, it’s not going to be easy to move without disassembling it. If someone is looking to get into shape without spending a lot on a system with extras frills, the Body Solid Pro GPR378 is the perfect setup. While other systems, such as TuffStuff or Bowflex, might offer systems with less weight and more mobility, the Body Solid Pro will provide longer durability and more raw strength training. Even better, the versatility of the machine in allowing other benches and accessories to easy work with the cage means users won’t have to worry about tossing out other workout supplies and weights they’ve already purchased.